Does the idea of camping in the winter leave you, well, cold? It doesn’t have to. Yurts are spacious yet cozy, feature many comforts of home, and are located in scenic locales. Camping is an activity that can be enjoyed year-round. However, depending on your location, the idea of winter camping can be less attractive. Falling snow, freezing temperatures, and long treks to a campsite can be daunting to even the heartiest of summer campers, especially those with kids. The solution? Consider a yurt. A yurt is a circular structure that's covered in skins, felt (traditionally), or heavy canvas (in more modern iterations). Easily transported, yurts are still used by nomads on the steppes of Central Asia in countries like Mongolia, Kazakhstan, and Kyrgyzstan. 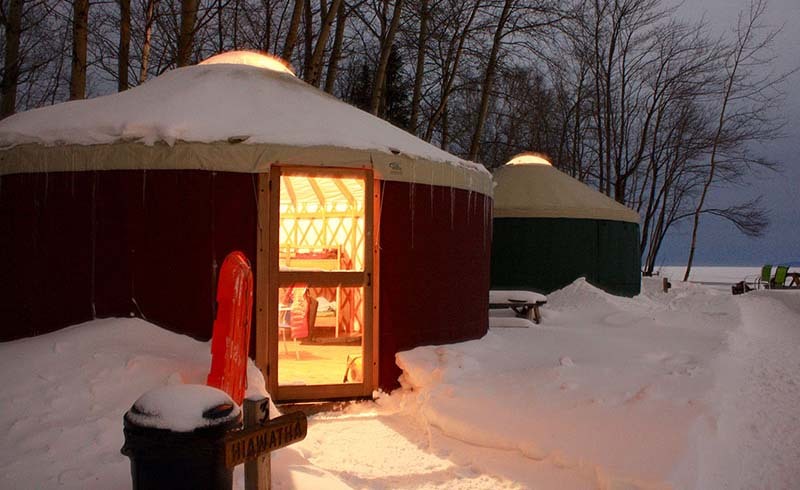 Modern yurts, located in the United States and Canada, have been adapted to withstand more extreme temperatures. North American yurts are more permanent structures, built with high-tech materials and sturdier internal bones. Now a popular addition to campgrounds, ski resorts, and state and national parks, yurts are a growing alternative to tent camping in the cold winter months. 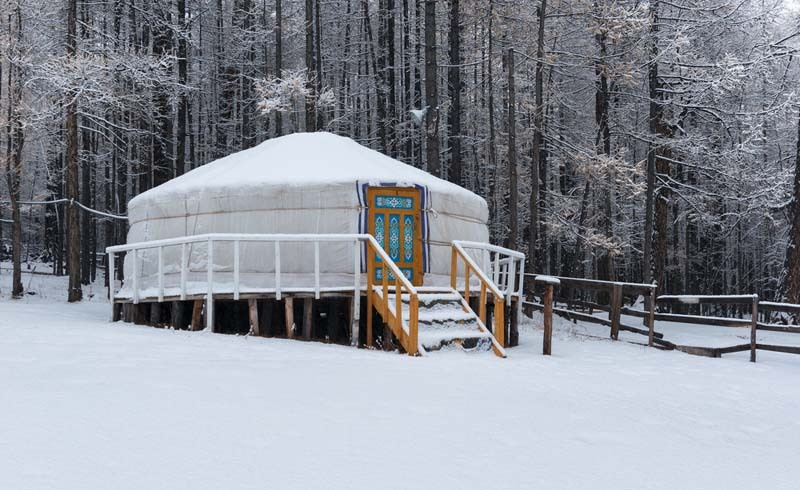 There several benefits when renting a yurt for an winter outdoor adventure, including the fact that the yurt is already constructed for you: There's no pitching a tent in a snowstorm. The walls keep out the winds and the floor is a much warmer alternative to a tarp over snowpack. Yurts are also a popular option for families and groups. While a tent can fit up to four people (maybe), it’s not necessarily a comfortable squeeze. Yurts come in varying sizes (some even have bunk beds) and can accommodate up to eight people. Some areas, like Snow Mountain Ranch in Colorado, have yurt villages, allowing several families or a larger group to rent structures in close proximity. Then there are the perks. Rustic yurts are pretty bare bones: just walls and a floor (you’ll haul in everything else). Deluxe yurts are for more of a “glamping” experience: These yurts can be equipped with refrigerators, microwaves, ceiling fans, standalone kitchens, and bathrooms. Yurts are available for rent across the United States and Canada, with an emphasis in the Pacific Northwest (an Oregon-based company was the first to manufacture high-tech yurts in the 70's). However, for winter camping in yurts, location should be a key factor in decision-making. For example, Cape Disappointment State Park in Washington has 12 yurts within walking distance of the beach; Mount Bohemia in Michigan’s Upper Peninsula offers downhill skiing in addition to cross-country skiing and snowshoeing for guests at their yurts; the yurts at Jackson Hole Ski Resort in Wyoming include the services of a “yurtmeister”; there are even yurts on the southern slope of Mauna Loa in Hawaii. Be sure to load plenty of layers. Even though yurts tend to be warmer than tents, it is still winter and you'll want to have plenty of options for staying cozy. Pack a pair of shoes for the yurt: down slippers, house shoes, or comfy crocs. You’ll be happy to slip those on after being in the snow. Use packing cubes to keep your gear organized and contained so that you don’t end up with your six-year-old niece’s fleece. Bring one bag. Yes, you’ll have more space than you would in a tent, but it’s not necessary to bring an entire wardrobe. Cards and games are always a hit and help a group bond. Don’t want to carry additional weight? Set up charades with just a pen and scraps of paper. For additional packing tips, read the ultimate packing guide. Have you ever rented a yurt for a winter camping adventure? What did you think? Tell us in the comments below!